St. Martin De Porres Co-operative Credit Union is still leading the cooperative credit union industry in the Ashanti region. The Union consolidated its gains as the union with the largest total asset size in the in competitive credit union market in the region for the second year running. The union progressed further last year by 30.33 percent in assets from Ghc 16,641,703.92 in 2016 to Ghc 21,688,924.34 at the end of the 2017 financial year ending June 30th. This was contained in the union's Board of Directors' report to members, management and stakeholders during the Union's 17th Annual General Meeting (AGM) which also coincided with the Union's 20th Anniversary Celebration in Kumasi recently. The event was also used to swear in a new seven-member Board of Directors to take over from the former board whose term of office ended last year. Chairmanship of Mr. Augustine O. Frimpong to take over from Mr. Laurence Otto and his team. The past Board Chairman of the union, Mr. Laurence Otto observed that, his team inherited GHc 7,123,678.78 asset size in July 2013. He indicated that the board together with management through effective supervision and monitoring was able to achieve a supersonic growth of 304.46 percent within a four year period they took leadership of the union, thus from Ghc 7,123,678.78 in June 2013 21,688,924.34 as at the end of June 2017. Mr Otto indicated that his team upon taking over in 2014 vowed to turn the fortune of the union around. He said through hard work and dedication, they were able place the union at such a strong and vibrant position in the credit union business in region in particular and the country at large. The former chairman said the St. Martin De Porres Cooperative Credit Union has the potential of becoming one of the best credit union in the country, urging the incoming board to build upon the success that his team has left behind. The new Board Chairman, Mr. Augustine Frimpong said his team would have to work harder in order to consolidate the market lead that his team has inherited and also take the union to another greater heights. 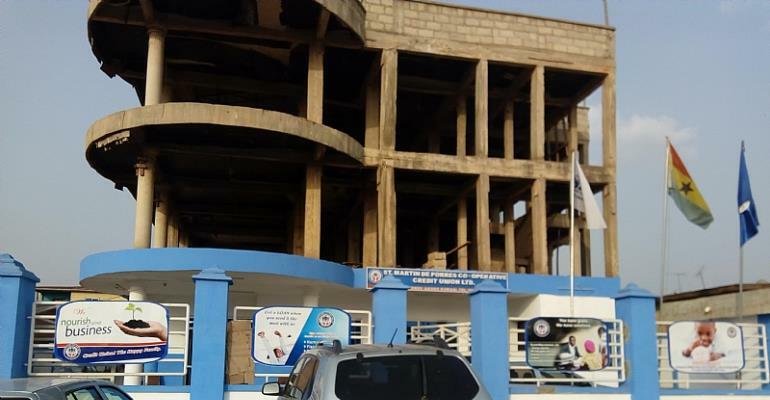 management in seeking to provide a conducive working environment for both union members and staff to transact business committed the needed resources to complete the ground floor of the union's head office complex at Atonsu Agogo and started operating from it since October last year. The Supervisory Manager following advice from the board of nnounced that management was also able to increase its staff strength by 108% from a little over 40 to 83 while the former Atonsu manager has been appointed as the union's current directors of the union. Mr. Fredua Agyemang further disclosed that the union committed substantial resources in the area of Information Communication Technology (ICT) due to the intense competition in the industry's technology drive, a development that is yielding great dividend for the society. He added that the union has computerized its Susu departments for all its branches while a union website has been created to enable both members and non-members track and follow the union's progress. Mr. Fredua Agyemang then appealed to members whose shares are below the required minimum to top up in order to reflect on the union's position.